Two password managers in Windows 10, LastPass and Roboform, are both excellent choices. Most people prefer LastPass, but you your circumstances might be different. You can use LastPass in all your browsers, on all your computers: Windows, Android, iOS, Chrome OS, Mac, you name it. 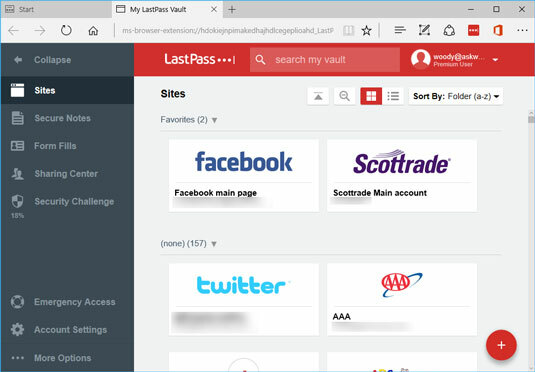 LastPass (shown here) keeps track of your user IDs, passwords, and other settings; stores them in the cloud; and offers them to you with a click. LastPass does its AES-256 encrypting and decrypting on your PC, using a master password that you have to remember. The data that gets stored in the cloud is encrypted, and without the key, the stored passwords can’t be broken, unless you know somebody who can crack AES-256 encryption. LastPass gives you one place to store all your passwords — and all the encrypting is done on your computer. LastPass works as a browser add-on for Edge, IE, Firefox, or Chrome, so all your passwords are stored in one place, accessible to any PC you happen to be using — if you have the master password. LastPass is free for personal use on PCs. The Premium version, which works on all sorts of mobile devices, costs $12 per year.